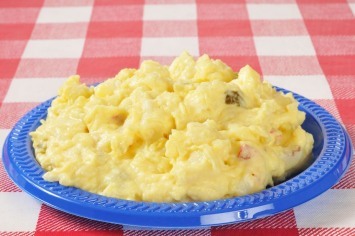 This old fashioned potato salad is made with a boiled dressing. You don’t see that as often these days but it is quite good. The sauce is creamy with a bit of kick from cider vinegar and turmeric, but is nice and rich too with the bit of butter that is added. Cook the potatoes whole, with their skins on. When they are cooked and cooled, peel the skins off with a knife and cut them into small cubes. In a heavy saucepan or top of a double boiler mix the sugar, flour, dry mustard, salt and turmeric. Stir together well. Whisk in milk, egg yolk and vinegar. Cook the mixture over a saucepan of simmering water or in a double boiler, over medium heat, until the mixture is thick enough to coat the back of a spoon, about 10 minutes. Stir in the butter. Let the mixture cool, stirring often. The dressing will keep thickening as it cools. Pour the dressing over the potatoes and mix lightly until thoroughly combined. You can add 1/4 of a red pepper, finely chopped if you would like. Add it to the potatoes before you add the dressing. 1 stalk of celery, finely chopped, plus 1/2 onion finely chopped are also nice additions. Add them when you would add the pepper. Find more summer salad recipes as good as potato salad here.